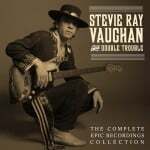 Legacy Recordings, the catalog division of Sony Music Entertainment, announces the label’s line-up of collectible 12″, 10″ and 7″ vinyl releases created especially for Record Store Day’s Black Friday 2015, celebrated this year at the nation’s independent record stores on Friday, November 27, 2015. Leading Legacy’s RSD Black Friday line-up this year is a 2LP 12″ vinyl 30th anniversary edition of Transformers: The Movie Soundtrack. 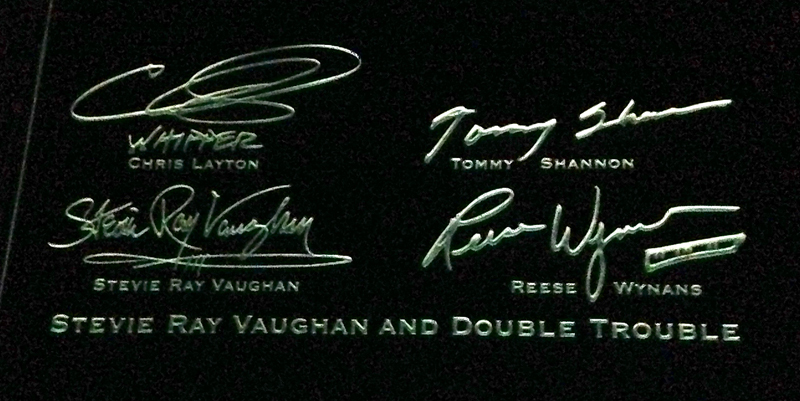 In commemoration of the 1986 cinematic blockbuster, Legacy has created an innovative gatefold jacket that completely converts all four sides of the cover from an Autobot-themed jacket to a Decepticon-themed jacket. This 2LP collection is pressed on 150gram color vinyl: LP1 in translucent red with the Autobot logo etched on side A; LP2 in translucent purple with the Decepticon logo etched on side D. Remastered and re-imagined, Transformers: The Movie Soundtrack has never looked or sounded better! Earth, Wind & Fire – The Best of Earth, Wind & Fire, Vol. 1 – 12″ 1LP Vinyl Picture Disc The Best of Earth, Wind & Fire, Vol. 1, EWF’s monumental 1978 anthology, compiled the group’s previously charting songs–including “Shining Star,” “Sing a Song,” “Getaway” and “Fantasy”–alongside new tracks including a cover of the Beatles’ “Got to Get You Into My Life” (which won a Best Arrangement with Vocal Grammy for Maurice White) and “September,” a song which became an EWF classic, hitting the Top 10 on both sides of the Atlantic. A Billboard Top 10, RIAA 5x platinum-selling album, The Best of Earth, Wind & Fire, Vol. 1 has been pressed as a collectible picture disc, featuring the iconic EWF gold coin logo plus a die-cut insert, especially for RSD 2015. The “Great Lost Isley Brothers Album,” Groove with You…LIVE! 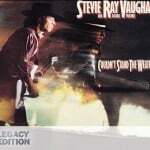 is a previously unreleased double album recorded for release in 1980. This newly restored performance offers an immersive listen into a crucial chapter in the Isley Brothers’ history, a pivotal moment in the fusion of rock and funk music in an era fueled by the sound of the Isleys. The album includes the hits “That Lady” and “Fight the Power” plus fan favorites like “Here We Go Again,” “Summer Breeze,” and “Voyage to Atlantis.” Featuring new cover art, evocative of the era, Groove with You…LIVE! is a 2LP set pressed on 180gram gold (LP1) and blue (LP2) vinyl, designed to look like a classic release from the Isley Brothers’ T-Neck discography. American musical icon Johnny Cash was at a career highpoint and in the middle of a successful tour of Scandinavia in 1971 when asked to star in his own concert special for Danish television. Lensed before a small audience on a small sound set, Man In Black: Live in Denmark 1971 captures the essence of a Johnny Cash show of the era, showcasing performances with his touring companions–the Tennessee Three (his backup band) June Carter Cash, the Carter Family, Carl Perkins, and the Statler Brothers–on a setlist of hits, classics and songs-of-the-day including “If I Were a Carpenter” (Johnny Cash and June Carter Cash), the song that won the couple the 1971 Grammy Award for Best Country Performance by a Duo or Group with Vocal. Previously commercially available only as a DVD (released in 2006), the audio portion of Johnny Cash’s Man In Black: Live in Denmark 1971 can finally be enjoyed for the first time as a full-length album on RSD Black Friday 2015. This collectible 2LP set is pressed on 120gram opaque white (LP1) and red (LP2) vinyl (the colors of the flag of Denmark). Composer Neil Hefti’s iconic theme music from the 1960s live action television series, a runaway hit in 1966, coupled with “The Batusi,” a go-go dance parody of “The Watusi,” introduced on the “Batman” premiere episode, characterized by its signature move: making a horizontal V-sign with the index and middle fingers of both hands and crossing them in front one one’s eyes. The “Batman Theme”/”The Batusi” single is pressed on opaque yellow vinyl in a newly designed picture sleeve inspired by the original graphics of the show. Braff’s work as the album’s producer and musical curator earned the 2005 Grammy Award for Best Compilation Soundtrack Album for a Motion Picture, Television or Other Visual Media. Garden State – Music From The Motion Picture has sold more than 1.3 million copies and is certified platinum by the Recording Industry Association of America. Jimi Hendrix – Burning Desire – 12″ 2LP – First 5,000 Copies Numbered Burning Desire is a posthumous compilation of recordings by Jimi Hendrix including instrumental studio jams and demos recorded in late 1969 through early 1970. Originally released on Dagger Records, Burning Desire has never been released on vinyl (or sold as a CD in stores) prior to this new RSD Black Friday 2015 release. The first 5,000 copies of Burning Desire will be numbered. A special commemorative release celebrating the upcoming 30 anniversary of Falco’s career-defining hit, “Rock Me Amadeus” features the song’s American edit (#1 on the Billboard 100 in March 1986) couple with Falco’s “Vienna Calling” (the 86er mix which peaked at #6 on the US Billboard charts in 1986). This RSD Black Friday 2015 IMPORT single is limited to 1,000 units in the US. 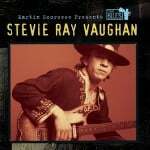 October 3: In honor of Stevie Ray Vaughan’s birthday, please enjoy and share this playlist of SRV music videos. August 27: Today is the 25th anniversary of one of the saddest days in music history. 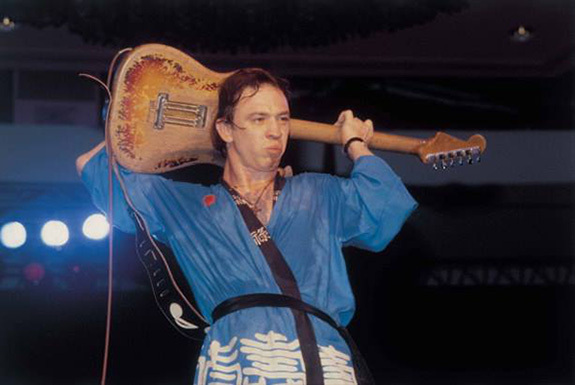 Stevie Ray Vaughan was only 35 years old when he lost his life. 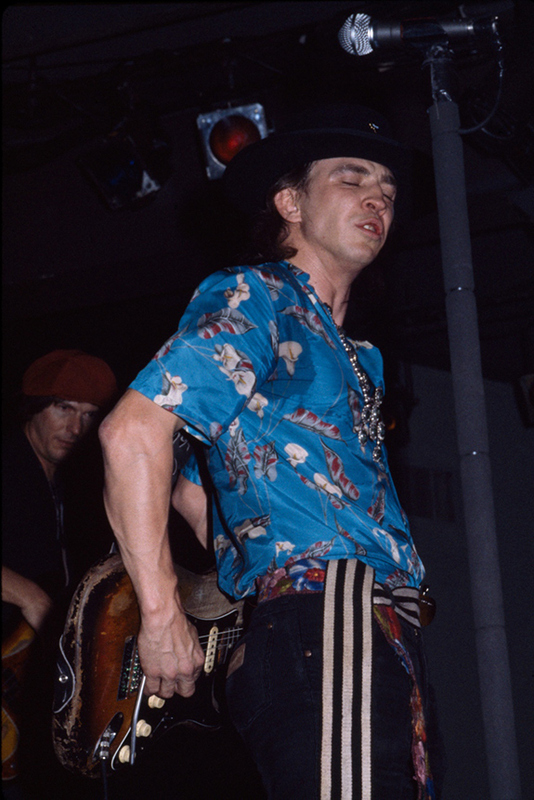 This photo captures Stevie on stage in New York shortly after the release of his immortal debut Texas Flood. 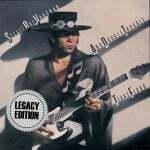 Guitar World is celebrating what they believe to be the 10 greatest guitar moments of Stevie Ray Vaughan’s career by posting 10 historic performance videos. Do you agree with their list? Watch all 10 videos now at Guitar World. Tune in to the Rock and Roll Hall of Fame induction ceremony this Saturday, May 30th at 8 p.m. EDT on HBO​! 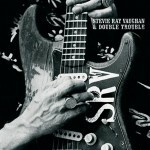 John Mayer​ inducted SRV & Double Trouble during the ceremony, which was recorded April 18th at Cleveland’s Public Hall. 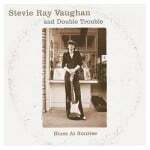 Jimmie Vaughan, the members of Double Trouble, and their guests all performed. 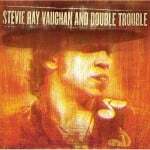 In celebration of SRV & Double Trouble’s induction, here are some of their best music videos. 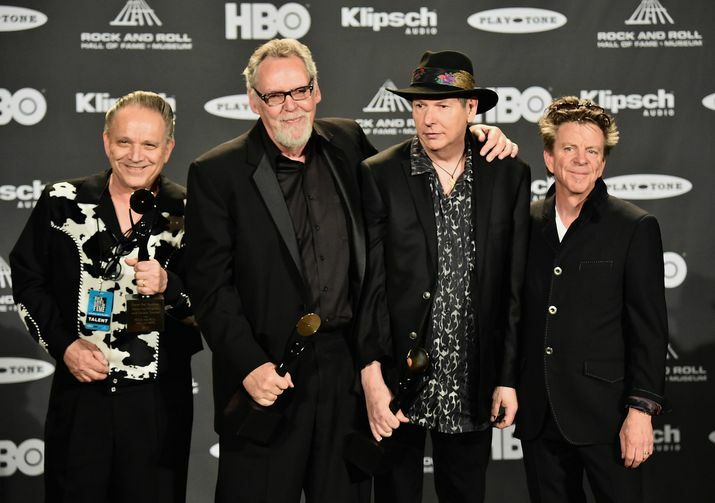 HBO has released a video with highlights from the 2015 Rock and Roll Hall of Fame Induction Ceremony, which will air on May 30th at 8 p.m. ET, exclusively on HBO. 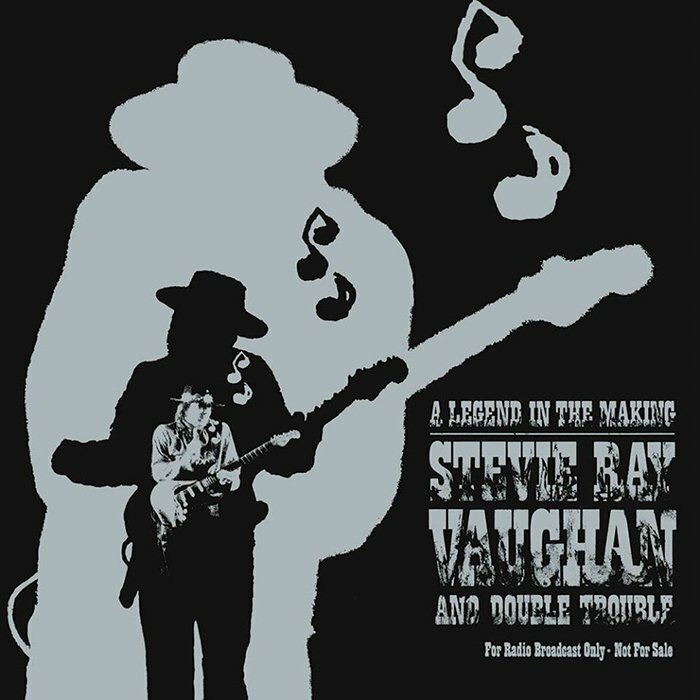 In the video below, tune in around 2:09 for a glimpse of the tribute to Stevie Ray Vaughan and Double Trouble. Oh, there are so many. He could just play so much harder than everybody. … If he was trying to beat you onstage, if he couldn’t beat you he would pull out Albert King licks and Jimi Hendrix licks, and then usually people would just give up. 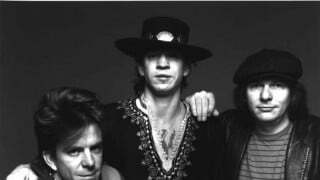 Stevie Ray Vaughan and Double Trouble now have a permanent spot in the Rock and Roll Hall of Fame. 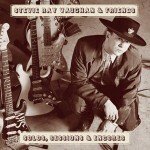 The Texas guitar hero was inducted into the historic museum on April 18 in Cleveland, Ohio. 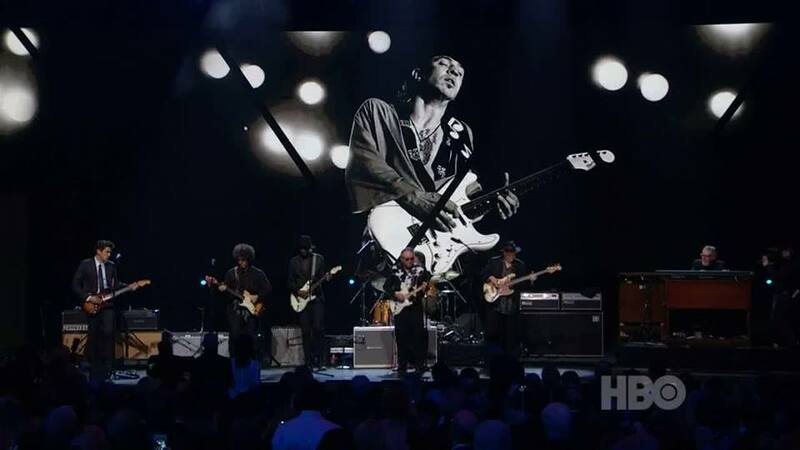 The Rock and Roll Hall of Fame induction ceremony airs on HBO on May 30. 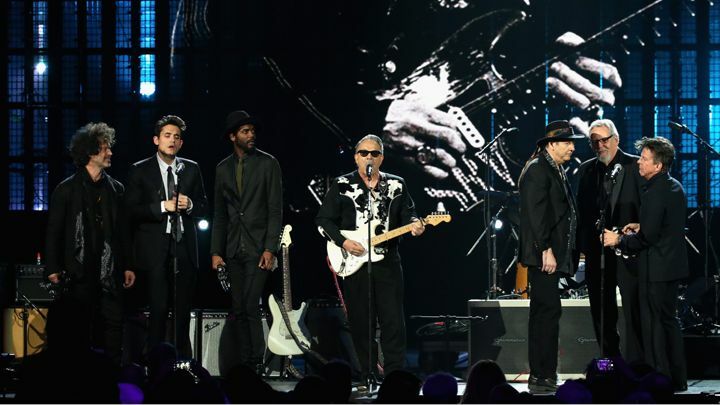 … “I know he would want to thank the Rock and Roll Hall of Fame, but most of all he would want to thank his fans,” Jimmie Vaughan told the crowd. 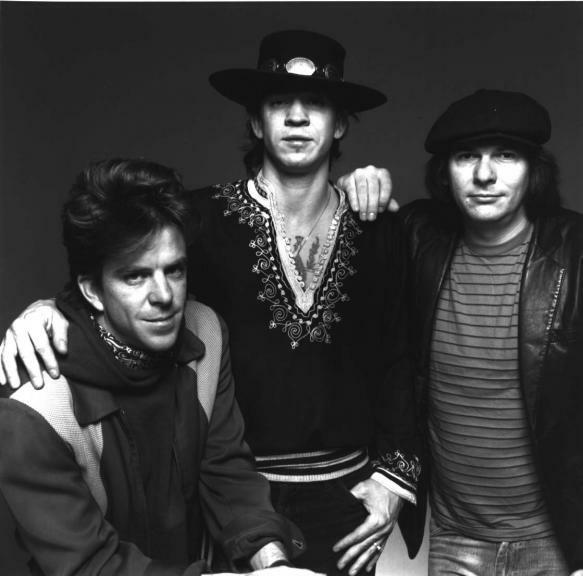 SRV and Double Trouble received 18 million votes to be inducted into the Rock Hall. 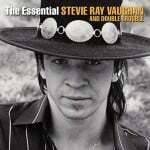 It was a moment fitting of the magic and emotion that filled Stevie Ray Vaughan’s music. 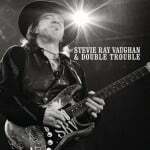 Having thrilled the capacity crowd Saturday at the 30th annual Rock and Roll Hall of Fame induction ceremony with sizzling blues guitar solos and fever-pitch vocals on Stevie Ray Vaughan’s “Pride and Joy” and “Texas Flood,” Jimmie Vaughan gathered the members of Double Trouble and their guest performers for the finale of their three-song set. Jimmie alone played guitar as they went into “Six Strings Down,” a tribute to his younger brother from Jimmie’s 1994 album Strange Pleasures. 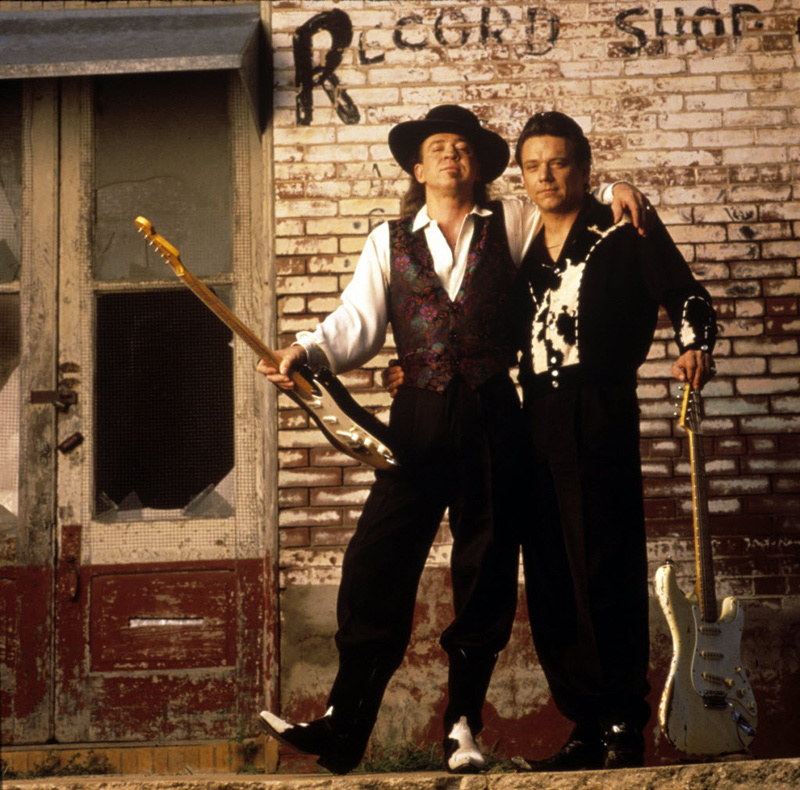 Bassist Tommy Shannon was just 26 when he walked into a Houston bar and was floored by the young guitarist onstage. 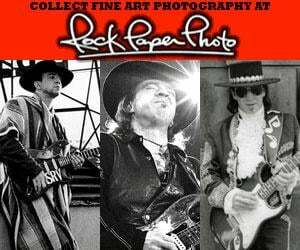 … That chance meeting welcomed in a decade of music, tours, gold records and critical acclaim for Stevie Ray Vaughan and Double Trouble, who will be inducted into the Rock and Roll Hall of Fame this weekend. 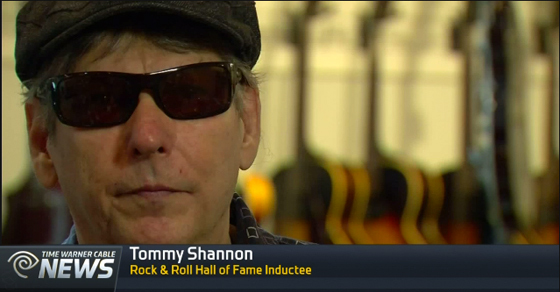 Watch the Tommy Shannon interview at TWCNews.com.